Wreaths are easily the most versatile natural decoration imaginable, for, not only can they fit in with a wide range of inside and outside decor, they look amazing all year long. No matter the occasion, your surroundings can be greatly enhanced with a gorgeous wreath. As fall approaches, the leaves are cascading to the frosted grass and you are starting to experience cravings for apple cider and pumpkin pie. Traditionally known as the harvest season, autumn is the perfect time for showing off all the products of a successful summer. Featuring hues that emulate the colorful leaves outside, such wreaths provide the perfect backdrop for any autumn gathering. Decorating with letters is very trendy right now. 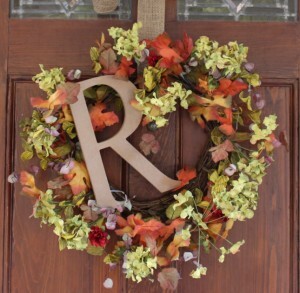 Personalize your wreath with the first letter of your family name to welcome guests. Letters can be attached with floral wire or even zip ties. Attach colorful fall stems and seasonal picks to refresh an older wreath. On wreaths with a vine base, you can usually "tuck" a pick right into the base between the vine segments. Wreaths with hand wrapped or plastic frames may require you to use some floral wire or tape, zip ties or even hot glue to add your picks. Weave seasonal ribbon throughout a wreath to beautifully coordinate with your decor. 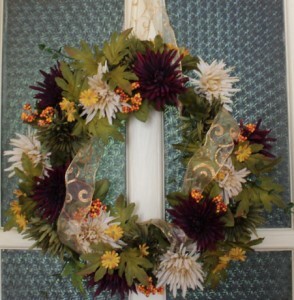 The Wreath Pro wreath hanger makes this very easy to do. See this Wreath Pro how to video for an explanation. 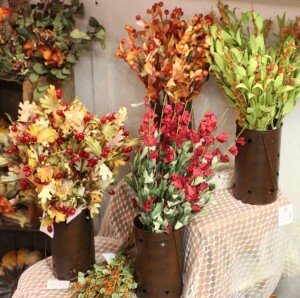 No matter the occasion, your fall surroundings can be greatly enhanced with a gorgeous wreath. You'll be amazed at how such a simple decoration can add warmth to your home.